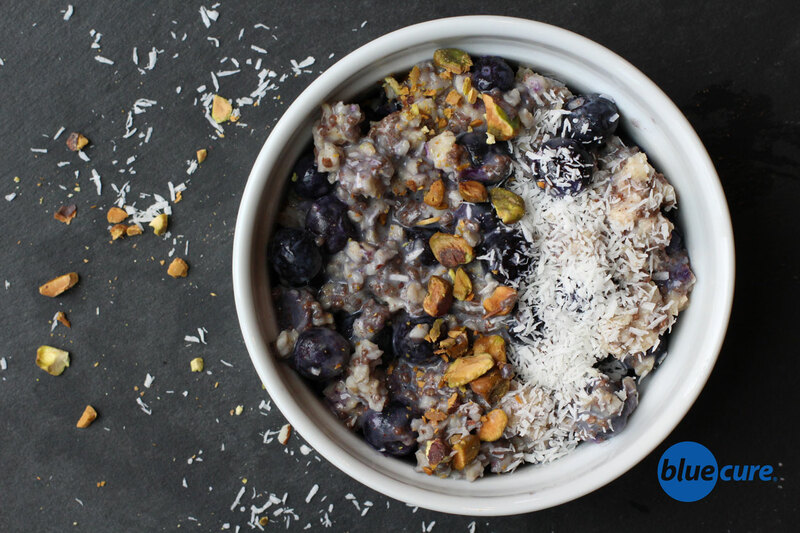 Start the day with this nutrient-packed oatmeal bowl. It’s loaded with antioxidants, fiber, healthy fats— and taste! Added bonus, it’s also quick and easy to make. Despite being higher in fat, nuts does not appear to contribute to weight gain; perhaps because some of the fat is not absorbed and because nuts are so filling– keeping people full until the next meal. Pistachios, in particular, may be beneficial for men, especially those with erectile dysfunction. *If you can’t find unsalted pistachios, rinse well before adding to the dish. Bring ⅔-1 cup water to a boil. Once the liquid is near boiling, add in the oats. Reduce the heat to low. Cook for 5-8 minutes, or until the oats are soft. In a bowl, combine 1 tablespoon of chia seeds and ¼ cup of plant-based milk. Stir and allow the chia seeds to soak for a few minutes. Once the oats are finished, add in the vanilla, cinnamon, blueberries, pistachios, and stir in the chia seeds. Add additional plant-based milk, if desired. Pour into a bowl and top with coconut flakes and more berries. Enjoy!